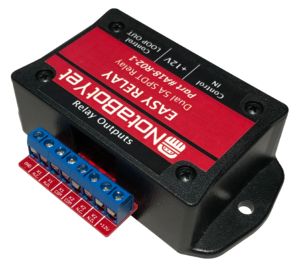 Let’s face it, sometimes you just need a basic relay…something with a little bit of power handling to control that new on-air light, or cooling fan, or whatever it may be. Usually that means scavenging through the parts bin, heating up the soldering iron…all while keeping the station on the air, keeping the PD’s headphones working, and figuring out what the remote-tech broke this week. 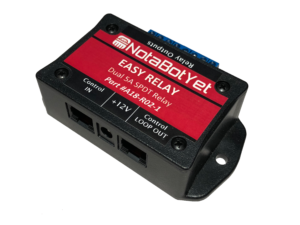 If only there were something easier…something like…the EASY RELAY from NotaBotYet! 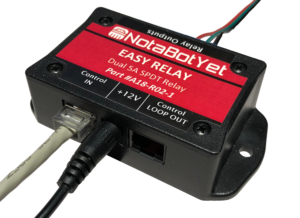 Plug and play with Axia GPIO using our NotaBotYet Axia Breakout (Part #A15-B01-2) or directly to the Wheatnet Logic RJ-45. 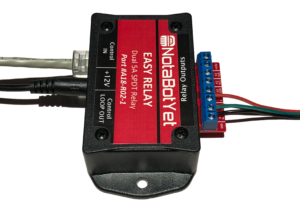 Two powerful 5A relays with NO and NC contacts for convenience. You can even daisy chain with other NotaBotYet devices! The included power supply powers the relay coils and can also provide +12V to an external device like an on-air light. 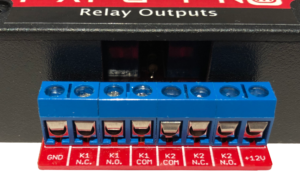 Inputs: Inputs are available on a convenient RJ45 connector allowing the use of standard Cat5/6 wiring to transport GPIO control within your plant. 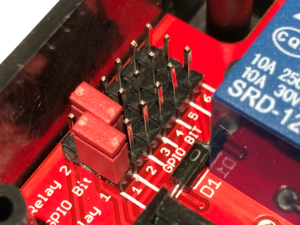 Inputs are designed so that a standard Cat5 Ethernet cable with straight-through wiring can be used to connect the Easy Relay directly to the logic output connector of a Wheatstone® Blade, or to the output port of our Axia GPIO Breakout. (Part Number A15-B01-2) The inputs can also be used with any other type of GPO logic closure to ground such as computer GPIO logic cards or other open collector or dry contact based GPIO control signals. Power is provided by an included +12V 1A power supply. The +12V is also available on the screw terminal outputs and can be used to power LED ON air lights or other 12V items as long as the current does not exceed 1A. Mounting: The devices is packaged in an easy to mount ABS Plastic case. This takes up a minimum of space in the plant and allows the end user to employ a variety of mounting schemes based on their needs. Mounting screws are included. Other types of screws and mounting may be used as well, per the creativity of the end user.